"He lived so many years with small intervals of recuperation, in visible glory, honored by the world, yet in spite of that, troubled in spirit, and all the more troubled because no one would take his trouble seriously..."
"...Don't shed a tear/'cause Mama/I ain't happy here..."
Tupac Shakur, "I Ain't Mad At Cha"
I am sure that neither Franz Kafka, nor Tupac Shakur have ever met Baltimore painter Larry Scott. Yes, it is quite absurd; one died seven years ago in a shower of nine millimeter mystery and counterfeit love, the other nearly a century ago from savage tuberculosis and public ennui. Yet the viscous that bonds all three is the need to be experienced; that humid, gothic desire fueling the mythic virus known as glitteraticosis, p.k.a. mad fame. Not that Scott, the 46-year-old Newark, New Jersey native and husband, father, and grandfather is sweating the art world for acceptance. His amazing work just wants you to holla if your feel it. In a snoring, regressive art culture populated with timid provocateurs, angry submissives, and cautious reactionaries, Scott is a quiet realist. Meeting him for the first time, and you might imagine the middle cousin between a young Gordon Parks, and the present day Denzel Washington. 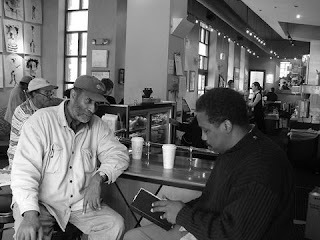 At the popular Xando-Cosi Coffee and Bar on 31st and Charles in East Baltimore - probably the best caffeine station in the city, and directly across the street from the prestigious Baltimore Museum Of Art - Larry Scott holds court with manager and assistant manager Randall Hurt and Sam Mason, along with some of the regulars; multi-media artist Natalie R. West, Nur the cabdriver, Mark Cottman and Jonathan Azor (two more great painters), and the novelist Jonathan Jackson - and appears to be beloved by everyone in the cafe. Scott is opinionated but not overbearing. He also serves as the curator for art gallery in Xandos, which hangs some notable work on both floors. 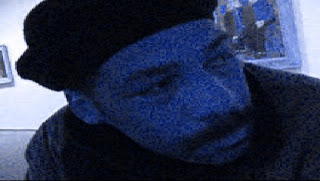 He has created a loose collective of Baltimore artists known as ComZee, which includes the painters Cottman, Azor, Eugene R. Coles, Don Griffin, Jeffrey Kent, Tony McKissick, Arin Mitchell, and photographer/graphic artist Sutikare. Scott may be at the forefront of a new movement of black art on the east coast. I call it Art Noir Eleve, or “High Black Art.” And without question, Baltimore could become its epicenter. 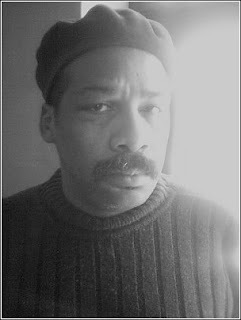 Jonathan Jackson - the nephew of “Notes From A Soledad Brother” author and 70s revolutionary George L. Jackson, and whose first novel, “The Reductionists”, penned under the pseudonym “Ivan O. Martin” is a striking debut - has nothing but bon mots for Scott. “Larry is not just a great painter. He is a friend who I can talk to when I need advice, and is in no way shape or form judgmental. But he will not pull any punches, either." When artists speak of line, it’s their imprimatur, their calling card. Analogous to Coltrane’s effervescent polyphonic runs, or Marvin’s urgent vibrato, a painter’s line will speak volumes about both the picture and the painter. 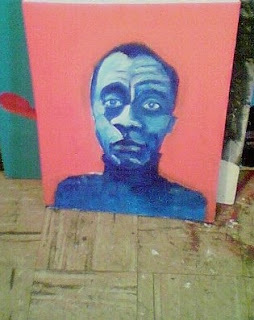 In the massive corpus of Scott’s work, consisting of abstracts, figurative Expressionism, surrealism, and bold colorful portraits of historical figures like James Baldwin - whom he met in the airport at Brussels back in 1986, two years before he won his last and final world karate championship - the line really jumps out in his prolific, “Evolution Of Depression”. 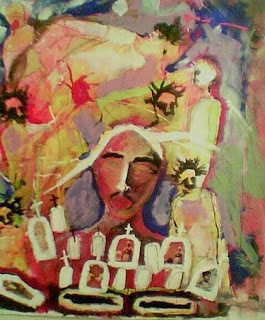 (A portion of Larry Scott's 200-piece series titled, "Evolution of Depression", 2003. 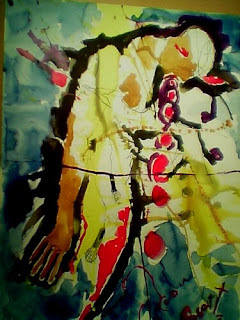 The summer of 1970 (maybe it was 1971) was the first time I “felt” a painting. 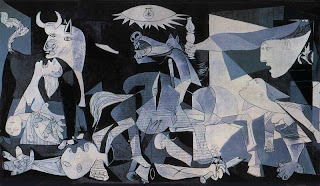 As a 12-year-old in Harlem’s Minisink Day Camp, I couldn’t articulate it, but understood on some level in that wing of the Guggenheim Museum, that I was moved by Picasso’s “Guernica.” I was transfixed; trying to decipher the hieroglyph of the light bulb, the mélange of fear and anger on the face of the bull, the fallout of cubist carnage. The impact of the work was wowerful; whoever, whatever, whenever Pablo Picasso was, I felt Guernica. Sitting downstairs at Xandos and looking at Larry Scott‘s “Ready2Die…? (pt.1)," I feel the déjà vu of “Guernica” once again. 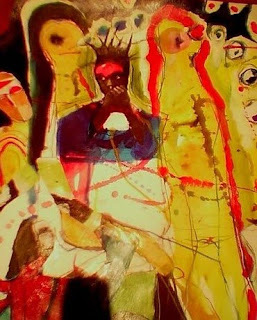 It is a 32”x36” watercolor and acrylic, mixed-media tour de force focusing on the bandana’d, optic-less face of Tupac Shakur. His visage is the centerpiece, seemingly suspended in a place of spirit-sleep as faceless chimeras (one of whom has a sunburst of red splashed on the solar plexus; a murderous Rorschach?) adorned with twisted dreads and elastic, ghastly limbs, in some muted netherworld contention over the soul of the eminence-grise of Thug Life. 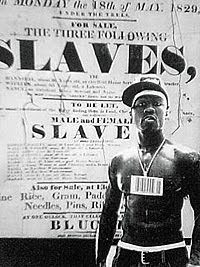 It bottoms out with several alabaster caskets with crucifixes attached to them like deified antennae, which also entomb a collection of photographs; an ice-grilled Bobby Seale; a chocolate child-princess that could be one of the four girls bombed to bits in that Birmingham church; several Aunt Jemima archetypes, a sepia-toned and chiseled jaw soldier from World War I. “Ready2Die…? (pt1)” also bethinks one of Basquiats most engaging pieces, the 1982 acrylic and oil work titled “Profit I”. The crashing symbolism (of Byzantine halo ringed around the trademark grimacing doodle-head; a backdrop of crossed out mathematical figures, tic-tac-dough apocrypha; the Roman numerals “1981”) strikes a chord of suspicion that “Profit I” (One?) 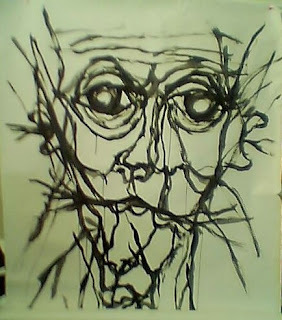 is actually “I, Profit”, a blistering self portrait. As if JMB has peeped game…the ones who make you make you corpulent with filthy lucre and fabulousness can’t wait to watch you wretch with spiritual anorexia. “ Ready2Die…?" (a series of six different pieces) subsumes its own iconography, making Larry Scott the first modern painter to depict rap as a cultural crime scene. In doing so, Scott both autopsies rap’s infatuation with nihilist narcissism and laments the malediction of def raps falling on deafer ears in the midst of a graveyard of young and beautiful corpses - not all of whom are literally deceased - who undoubtedly got rich and most assuredly (in some form or another) died trying. Below is a scene from my online art film/webiseries Blood On The Wall$, which features Larry Scott. The guy was a not only a great artist but a capable first time actor, too. Very interesting article. I enjoyed reading the information on Larry Scott. He produced some thought provoking work. @msladydeborah:thank you for your kind words, and yes, Larry Scott was a truly prolific, profound, and provocative artist. GOD Rest his soul. Thanks again for your feedback. I appreciate it.